Demand-based selection, which can be defined as collection development that reflects the needs and perspectives of library patrons, is a major component of collection development in modern libraries. Public library customers, in particular, insist on having a say in what books their tax dollars make available to them. Demand can be assessed by such measures as circulation, holds, customer requests, bestseller lists, and more. Perhaps the most famous and influential proponent of demand-based selection in public libraries was Charles (Charlie) Robinson. Charlie Robinson was the director at Maryland’s Baltimore County Public Library (BCPL) from 1963 to 1996, and he led BCPL with a strong customer service philosophy. Many of his ideas—including centralized, demand-based selection and collection development—were very controversial. At the time, the argument over collection development was framed as either “give ‘em what they want” or “give ‘em what they need.” The "give ‘em what they need" side often reflected an element of elitism, judgement, and a desire to "improve" patrons and their reading choices. As libraries have become more interested in demand-based collection development, the wholesalers and vendors who sell materials to libraries have adjusted, as well. Value-based services expanded, and libraries found ways to get new, popular titles as quickly as bookstores received them. Why is this important? Because not only do patrons want the books that interest them, they have come to expect access to new titles as soon as they become available. So let’s look at the modern public library, the role of demand-based selection, and its tools. Should libraries approach materials for children, young adults, and adults in the same manner? How about different formats, like audiobooks, e-books, large print, hardcover, trade paperback, mass market paperback, graphic novels, and videos? These are questions each public library needs to ask itself, then modify its selection policy accordingly. When it comes to selection of children's materials, there still seems to be a prevailing attitude of “we know what kids should be reading.” As such, perhaps a higher standard of quality assurance should be applied. Many libraries accomplish this by including a minimum number of positive reviews in their criteria for adding a title to a selection list, as a "hedge" against misguided recommendations. This makes sense for second-tier fiction and most non-fiction titles, but may be too limiting and take too long for first-tier popular fiction and hot new titles. Catching those popular titles for children and getting them on the library shelves quickly can be a challenge. Having a children’s series standing order program that is reviewed periodically can help. A standing order for popular authors is another option. The popularity of children's series and authors can wax and wane more quickly than adult fiction authors and series, so I recommend reviewing and revising those standing orders regularly and frequently. Talking with public service staff and customers might also alert selection staff to new hot topics or titles for children. Consider using selection lists for graphic novels, which are very popular among children, teens and young adults. (Check out Kat Kan’s graphic novel selection lists.) Nonfiction for young adults is often included in adult and/or children’s library collections, and high-demand titles should be picked up during selection for those collections. Gauging demand for young adult fiction can be a challenge. How old are the young adults who use your collection? What formats do they prefer? Do your graphic novels disappear, while your hardcover fiction just sits on the shelf? Are audiobooks popular? Again, using some author and series standing orders can alleviate some of these issues. Filling in gaps in your popular graphic novel series can also help meet demand. When many people think of demand-based selection, adult books come to mind: those titles that make the bestseller lists. In order to meet demand, public libraries need to have these titles ordered and self-ready before they hit the bestseller lists—and in sufficient quantity to help meet the inevitable demand. 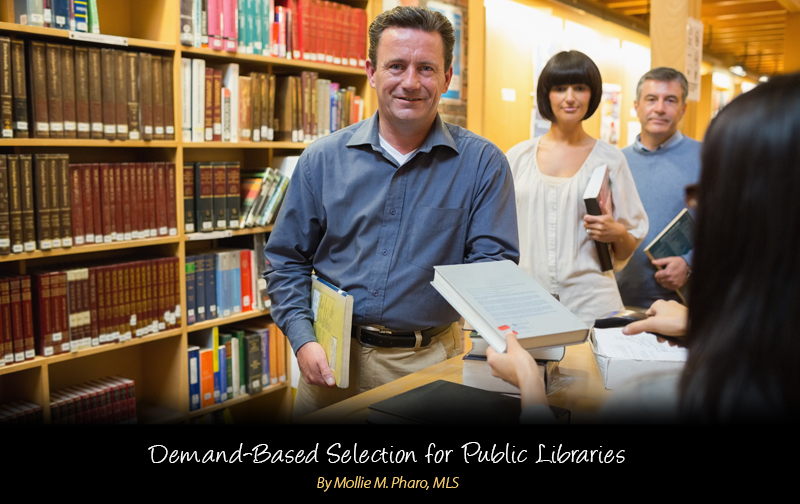 When libraries use Brodart for vendor selection of opening day collections, ongoing selection, or special projects, each library determines exactly what role demand-based selection should play. With Brodart's selection lists and standing order programs, the library can choose which authors or series to include, and can even add authors or series that are locally popular. The titles can be automatically ordered or can be put on a selection list for the library to select from. The titles are ordered pre-publication, so they can be processed and ready to be shelved for patrons on the day they are released. By taking advantage of McNaughton® lease plans, libraries can shelve several copies of a popular title during peak-demand time without having to purchase that many copies. For public libraries, embracing demand-based selection means satisfying patrons' expectations—within reason—according to thoughtful, considered parameters. Bear in mind that this approach is not the only consideration when selecting materials for collections, and indeed should be one of many criteria. However, using the right tools and approach can help any library ensure that popular and sought after titles are available on shelves when patrons expect them. Roll, A. (2016). Both Just-In-Time and Just-in-Case. Library Resources & Technical Services, 60(1), 4-11. Pearl, N. (1996). Gave 'em what they wanted. (cover story). Library Journal, 121(14), 136. Berry, J. I. (2016). Arguing with Charlie. Library Journal, 141(8), 10. Berry, J. I. (2016, May). OBITUARY: CHARLES W. ROBINSON. Library Journal. p. 14. Robinson, C. (1992). The Public Library Vanishes. Library Journal, 117(5), 51-54. Robinson, C. (1989). Can we save the public's library? (Cover story). Library Journal, 114(14), 147-152. Fialkoff, F. (2005, July). Balancing Act. Library Journal. p. 8. Williams, P. (1990). How Should the Public Library Respond to Public Demand?. Library Journal, 115(17), 54-56. Bob, M. C. (1982). THE CASE FOR QUALITY BOOK SELECTION. Library Journal, 107(16), 1707. Annichiarico, M., & And, O. (1993). Public Libraries: Responding to Demand. Library Journal, 118(3), 129-35.